As the Superliga awakens from its summer slumber and returns to action in two week’s time, the ‘city’s team’ FC Copenhagen is hoping to continue to lead the way. Having secured the league and cup double two years on the trot, the champagne corks will be popping again tomorrow as the club celebrates its 25th anniversary. Already firmly within its grasp, is a young, but eventful history. So how did FCK become the leading force of Danish football in just a quarter of a century? Well, actually, the club has far more history and pedigree that one might think. A relative infant, the club was created in 1992 through a merger of historic clubs Kjøbenhavns Boldklub (KB) and B1903 – a move widely credited as improving the standard of Danish league football over the last two decades. The idea of creating a merged team to represent the city as a whole had been on the table since the late-‘80s. The main issue was that the city’s many regional clubs were all vying against each other, thinning the spectator base and preventing any one side from developing a strong team. Finally, in September 1991, it was announced that two of Copenhagen’s clubs would merge to create a citywide team. But board members of the as-of-yet non-existent team defended the decision. The merger of the teams was, strictly speaking, a restructuring of the two clubs, where the best facets of each would form FCK, while each club would still field non-professional teams in the lower divisions. KB would provide infrastructure, such as its training ground in Frederiksberg, while B1903’s players would form the team. With neither side possessing an adequate stadium, it was agreed that its ground would be the newly developed national stadium, Parken, which was to open the following September. But despite the general optimism, players from the two sides were concerned about their futures. The situation over at KB was worse. While B1903 had already approved the merger, KB had yet to have the deal agreed by its members. In the week running up to the general meeting where it would be decided, the players threatened strike action unless their futures were made clear. As a semi-professional club with only four players on contracts, the rest of the team would have less chance of being picked up by another team and would need to find other work. KB’s management announced two days later that all non-contracted players were open to leave the club at the end of the season, and at the general meeting on October 4 KB’s membership voted overwhelmingly to merge with B1903. This final seal of approval was the last hurdle in the way of establishing FCK, and while there was some sadness expressed at the loss of Denmark’s oldest professional side, many sensed that Danish football would be forever changed. 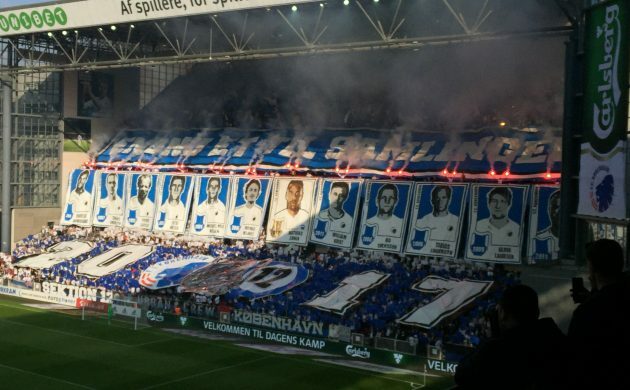 Commentators were quick to speculate on the impact that FCK would have on Danish football. Henrik List, writing for Berlingske Tidende, hoped that having a team based in the city centre would draw greater spectator numbers, as before you would have to travel to the suburbs such as Amager, Gentofte or Lyngby to watch a game. And whereas you might be lucky to get a turnout of a few thousand at these matches, he looked longingly towards London where games attracted tens of thousands of supporters. “That is what I, and other football fans here in Copenhagen, dream about – that it could be the same here. That football was not just something that happened in the suburbs. That Copenhagen had its own team. FCK, a fusion of the ‘golden-boys’ from Gentofte, B1903, and the continent’s oldest but success-deprived football club, KB, could be the answer to that dream. Over 20 years later the answer is a definitive yes. Despite topping the league in its first year, it would have to wait eight years to win another league title. However support for the club has grown steadily, with average crowds rising from 9,000 in their first year, to 20,000 in 2003 where it has hovered since. Despite difficult times in the mid-‘90s stuck resolutely in mid-table, the past decade has brought the club unparalleled success. This year could see it take its eleventh league title following two straight seasons finishing second as the club aims to return to the holy grail of Champions League. The vision that led to the inception of the team has become a reality – Copenhagen is now the proud home of a team playing to large boisterous crowds every week. Others, however, are ready to pounce and capitalise on any slip ups from the Lions. Aside from eternal ‘New Firm’ rivals Brøndby, FC Midtjylland and AaB Aalborg – winners of recent Superliga titles – have ambitions of their own and will not let FCK’s ascendancy to the upper echelons of Danish football go uncontested. And just what exactly have the Romans ever done for us?